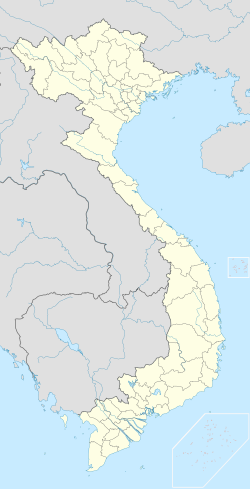 Nam Định ( listen) is a city in the Red River Delta of northern Vietnam. It is the capital of Nam Định Province. The city of Nam Định is 90 km south-east of Vietnam's capital, Hanoi. From August 18–20 of each year, there is a festival held in Nam Định called the Co Trach. This celebration honors General Trần Hưng Đạo, a 13th-century national hero who led Vietnamese forces to victory over the invading Mongols. Nam Định (actually, the village of Trà Lũ) is also the birthplace of Letran Student, Dominican Friar and Vietnamese Saint Vicente Liem de la Paz, O.P. De la Paz was canonized by Pope John Paul II on June 19, 1988 (Feast Day on 24 November). Nam Định has two sports facilities, Thiên Trường Stadium (formerly Cuối Stadium) and Trần Quốc Toản Indoor Stadium, which are host to football and volleyball matches. Both sports centers are located on Hùng Vương Street in the city of Nam Định. ^ "Vietnam Building Code Natural Physical & Climatic Data for Construction" (PDF). Vietnam Institute for Building Science and Technology. Archived from the original (PDF) on 22 July 2018. Retrieved 31 July 2018. This page was last edited on 21 March 2019, at 12:27 (UTC).